It is finally time for the big reveal from the 2016 Swap N Hop! 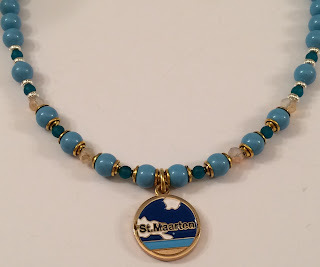 Back in February, I got some neat stuff from Lee Koopman of Strega Jewellry's Blog. You can see all the fun stuff on my blog here. The main requirement was first...do NOT send junk and second, send something that is handcrafted. Lately, I've been into making earrings. I have quite a few on my shop and I just love earrings. Lee made some fun things with leftover wire, and I decided to hang a couple of the purple glass beads she sent. I used bead caps to make a more finished look. Staying on the earring theme, I made these two sets of "peace" earrings with the peace sign beads Lee sent. I make paper beads, and decided to add some of my hand rolled/glazed beads. Aren't they fun? These earrings are made of crystal hearts and mother of pearl beads. The hearts are gray or purple in color, depending on the lighting. Lee also sent me some sari ribbon. A few years ago, I got hooked on this through another bead hop. Most of the items on my TappingflamingoBling Etsy shop are a Beachy Boho look, and this bracelet I made with the sari ribbon is very much that look. The ribbon is wrapped on a memory wire bracelet, so this should fit most wrists. I wire wrapped ebeads around and then added a mermaid charm. 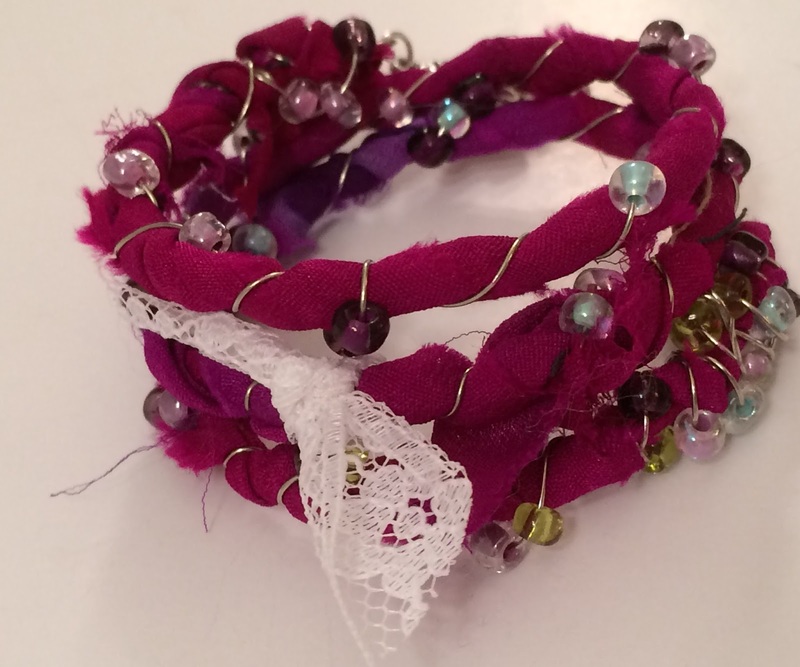 I then finished this piece off by tying a piece of white lace onto the bracelet...I love lace! While we are on the bracelet kick, I'd like to share my next piece with you. Lee sent me this hand stamped piece. I took some more of the sari ribbon she sent and made bead with it and then put it all together with this "old school" disc. It is a double bracelet. Again, we have that Boho look. I've actually been making more of these sari ribbon beads and have put them together in other pieces and they are now for sale on my etsy shop. Very Beach Boho, don't you think? This next piece is made up of all kinds of beads from one of my favorite colors...PURPLE!!! The lighter purple beads above, have that sea glass look. I love it! I love to put all kinds of textures and beads together in one piece. It makes it so interesting, don't you think? I used this button clasp that Lee made. This is actually meant to be seen, not hidden away behind your neck like most clasps. My sister gave me some seahorse charms, so I decided to use them with some of the beads Lee sent me. I plan to make another just like this one to give to my mom. Don't you love those turquoise beads? The small ones look like sea glass, and the larger ones are very colorful! Now for my last piece...First, though, let me give you a little background. Last year, I went on a cruise with my husband, youngest son and mom. Mom and I got some neat charms from a store in St Maartin...for FREE! I tucked them away for the right beads, and here they are! Again, I used the small turquoise "sea glass" beads. I also used some of the beautiful glass turquoise beads. I added a few gold bead caps, silver beads and crystals I had from my stash. I wanted to wear this piece with gold or silver jewelry, so that is why I have the silver beads and silver clasp on it. And here you have it. My creations for the 2016 Swap N Hop. I hope you go check out my partner, Lee Kooper's page, and then check out the rest of the group. I'm sure you will not be disappointed.